Love love love these! I placed these on the bottles and they have held up quite even though I wash the bottles everyday. Since we do have the Soothie for her pappy, I placed this on her pappy holder, which worked perfect! I would definitely order again. These labels were exactly what I was looking for. 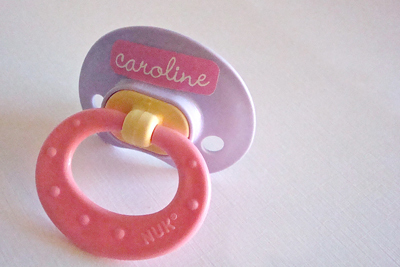 Something that was small enough to fit on a binkie but could also be used for bottles and cups. 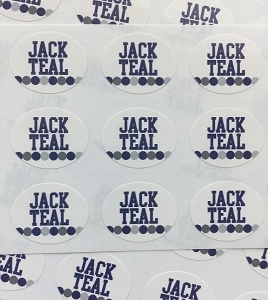 They are very durable and have only faded slightly due to sterlizing. I also found the price much more reasonable than other websties. Thank you! These are so cute!! They have been so durable and have not shown any wear at all. Seeing that I wash bottles every day, it's pretty impressive that they are still on! I did notice that after steam sterilizing the pacifiers, the colors did fade a bit. 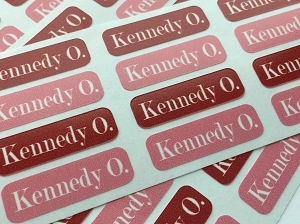 I ordered these labels almost a year ago to place on my daughter's bottles, pacifiers, and toys for day care. A year later - the labels are still sticking to the bottles and look brand new. I hand wash all of her bottles, so that helps with the life of the stickers. I'm back on the site today to order some more! I LOVE these labels. I have hand washed and put in dishwater and they still look like new. I will always buy my labels here. Thank you so much!! 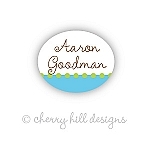 These little labels are perfect for pacis, bottles, glass food jars I send to daycare, bags and lots of other things! These labels are great. On the recommendation of a neighbor, I ordered them with first & last name and use them on small food containers for my Kindergartener's snack & lunch. They're just the right size. And they look brand new after a few months of constant hand washing. We are using these on her little bottles - they have been washed & steam sterilized for ~1 month & show no wear. We have "margot" on them which fits perfect. We LOVE these labels. Our little girl can't live witout her pacifier but they all get mixed up at Daycare - but not anymore! I have had several moms ask me where we got these labels - and the teachers are asking too! We use the Playtex Ortho Pacifier and it fits right across the front! Love them! These labels are functional and cute! They can be used for much more than pacifiers. Superb for ensuring that your little one's items don't get lost/mixed up at daycare. Some of the other parents at my child's daycare have commented on the labels and asked where I purchased them!